"Love Letters" by playwright A.R. Gurney, a drama about the love of two people spanning 50 years from 1937 to 1987, has been performed by a who's who of top actors since its Broadway premiere in 1988. 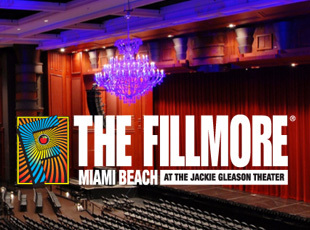 One of the most recent productions starred Ali MacGraw and Ryan O'Neal, and played Fort Lauderdale in 2015. 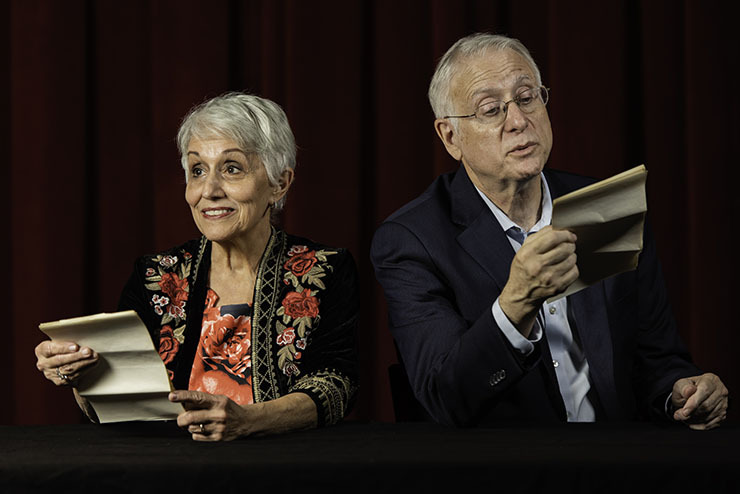 Now, at the Jewish Cultural Arts Theatre (JCAT) of the Michael-Ann Russell Jewish Community Center in North Miami Beach, real life husband and wife actors Lillian and Michael Andron offer their interpretation of the two-act drama. 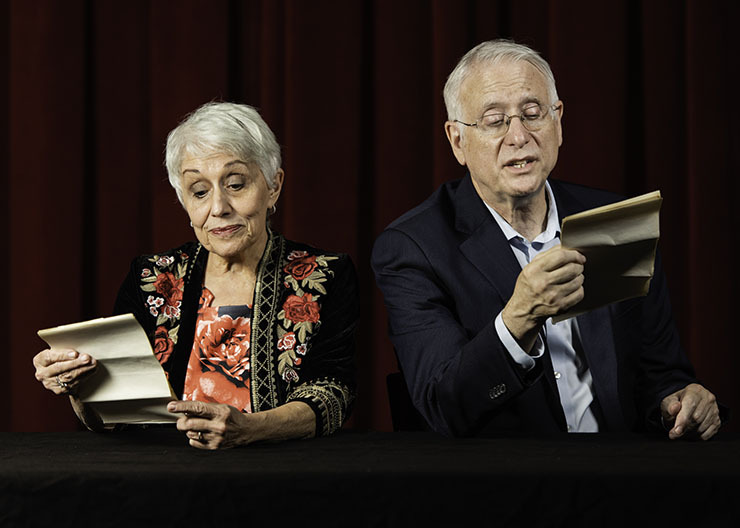 The couple portray Melissa and Andy corresponding their many adventures and feelings through letters written over 50 years, from childhood through old age. "Love Letters" is being performed at JCAT , now through Sunday, Feb. 17, with the Androns alternating with actors Debbie Bekefi and John Ferry in performances over the two weeks. Andy and Melissa met as children in summer camp and developed their relationship and letter correspondence through teen and college years and marriages and children with other spouses. Although the play and letters depict much interplay between Andy and Melissa, the letters tell of their anecdotes of their lives apart from each other. Melissa grew up the daughter of an alcoholic that led to many struggles. Andy went on to become an attorney and an astute and pragmatic politician with a wife and family. Act One details the ups and downs of Andy and Melissa's lives in the teen and college years as revealed in their letters. Act Two goes deeper into the different views of Andy and Melissa struggling with their domestic lives as their letter correspondence takes on a less spontaneous, but more thoughtful and heartfelt exchange of emotions, as Andy and Melissa reach out for comfort as well as love to sooth painful moments, such as the deaths of their parents. The play leads to a dramatic and surprising climax for the audience. "I and the other actors discovered nuances and hidden motivations within the characters: parental influences, influential biases and mores of societal status and of the times and experiences with teachers, friends, colleagues, all of which helped mold the characters' world views," says Michael Andron. 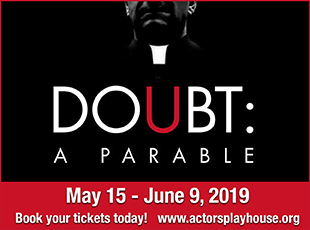 "We had a better understanding, in becoming Andy and Melissa, what led to the choices they both made that led them down their paths in life that unfold in the 'plot'," says Michael Andron, who also direct the production. "Melissa is a free spirit and affluent, giving her the opportunity to experience new life experiences and is drawn to Andy, who in many ways her opposite, a straight-laced character," says Lillian Andron. "The nature of the love shared by Andy and Melissa changes over the decades and it is though the letters that both the joy and pain of their separated lives are revealed." The play also showcases the art of letter writing, a skill that has become a lost art in the new era of email, text messaging and social media. "The letters are not just words, but convey the emotions and hopes of the writers. You have to both prepare and immerse yourself in letter writing that is of a higher standard than a text, tweet or an email today," said Michael. The Androns have been married for 46 years and share a love of theater. Along with being the founding director of JCAT, Michael Andron was Director of Theatre at Scheck Hillel Community School in Ojus, near Aventura, and acted in the Off-Broadway production of "The Fantasticks." Lillian Andron is a co-founder of JCAT and is its Assistant Artistic Director. She can be seen on local television in commercials. Lillian and Michael share a bond with the characters they play, says Lillian. "Michael and I came to know each other better through letters and the art of letter writing. I hope it is something that will not be lost," says Lillian. "Love Letters" is at the Jewish Cultural Arts Theatre of the Michael-Ann Russell Jewish Community Center, 18900 N.E. 25th Ave., North Miami Beach. Tickets range from $15 to 25. 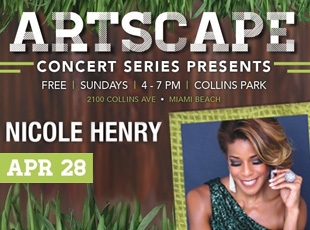 For dates and times, plus cast lists, go to www.jcctheatre.com or call 305-932-4200, ext. .130.